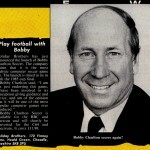 This game was announced in an issue of Home Computer Weekly back in 1985 and was to be sponsored by Sir Bobby Charlton. 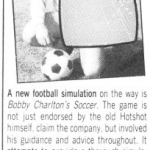 It was promised that the game was to be very accurate and also featured input from Sir Bobby himself! … However, apart from a mention that it was being released on the BBC Micro first and the C64 and Spectrum later, it only surfaced on the BBC Micro and neither the C64 or Spectrum. The game didn’t seem to be that well recieved, and it seems the developer went bust shortly after the BBC Micro version was launched, meaning that any potential conversion for the Spectrum/C64 may well have not been finished. We know little more than this at the moment, but maybe you can help? I have an untouched, unplayed copy of it for the BBC Micro. Yeah, it seems the BBC Micro made it out in good numbers, and the game you can download readily. Just the C64 version currently missing unfortunately.